It’s the season of resolutions. This means that many many people are saying: “I’m going to read more in 2019'“. For all of those people, I really do hope they do! I hear so many reports/comments made on how much less people are reading these days and it makes me sad. There’s so much goodness to be found to reading! Heroes/Heroines, bravery, goodness, truth and virtue, imagination, sacrifice, unlikely friendships and changed people, humor, delight, examples, and beauty. I hope that we see a shift in our world to place the written word on a much higher and more treasured shelf than any screen will ever hold. I say let’s change the tide! Let’s do it by raising little readers, by forming book clubs or reading through a book with one companion, by sharing what we’re reading with others and giving books as gifts, by using those 15 minutes to read rather than scroll, and by filling corners of our home with an array of classics and new releases, best sellers and hidden gems, new and used, paperbacks and hardcovers. Let’s be readers. 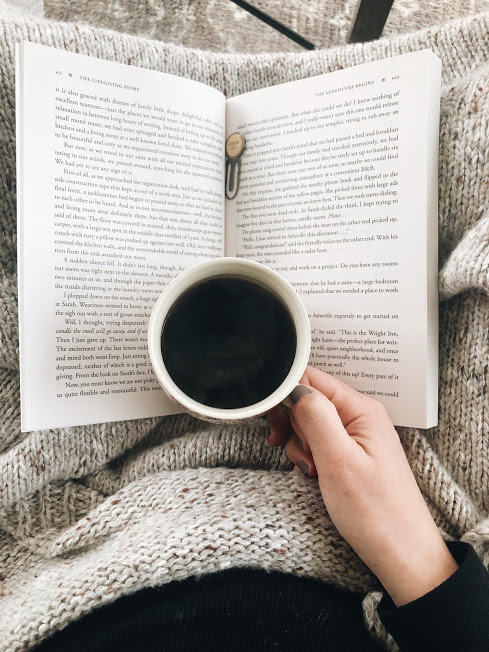 J and I made a change several months ago where we began turning shows on much less frequently in the evenings and instead, began filling that time with piping beverages and our current reads. It has become a favorite routine of ours. Those hours are now filled with pages and underlines and sharing bits and pieces of what book we are making our way through and we always go to bed so much more filled up. We want reading to be a rhythm in our home, for ourselves and with our littles. I have been eagerly gathering together my 2019 book list. Recently, I looked at my nightstand and the stack of books at the foot of it, all books I had ordered or been given last year, and I realized that I had barely scratched the surface of these titles. So came my plan. I have compiled my 2019 book list, so far as it stands now, with just the stack of books that already sits on or around my nightstand, on my desk, or gracing my coffee table. I only bought two books last month, both of which have been on my wish-list for quite a while, to complete the grouping. I’m starting here. Here are my literary companions for the coming months. 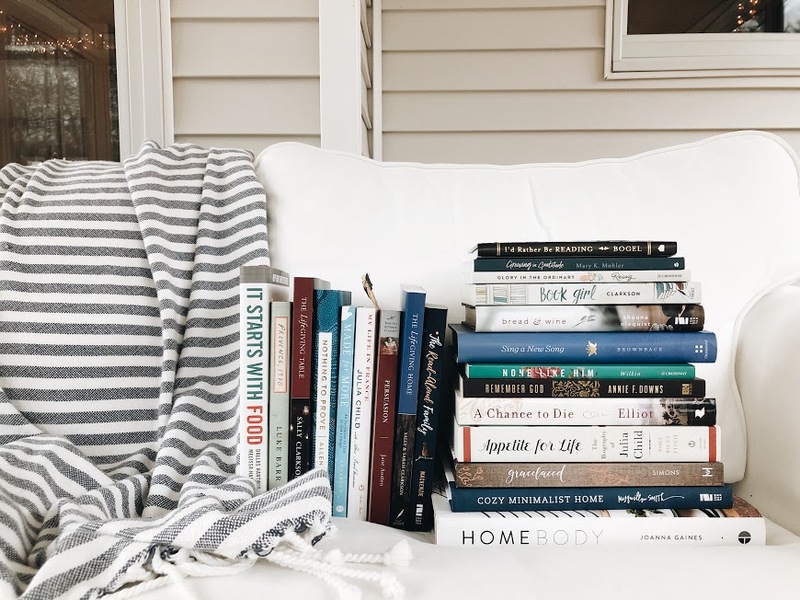 I have several biographies, many for-my-heart books, several titles about the home and the table, and one lonely fiction book — hence my plea for more fiction titles on Instagram the other day. Homebody is going to be a consistent companion book, It Starts with Food will be a more slowly digested read — J and I would like to do a Whole 30 sometime this year, GraceLaced will be enjoyed throughout the year as it is written in seasonal form and also sits on the coffee table, and Sing A New Song will be alongside as I read different Psalms throughout the year as it is written for that very reason. *Now, I do reserve the right to put a book down if it is just not holding me. I have always been one to feel I should finish any book I start, but in the past year my sentiments have changed and I’m letting go. If a book is not keeping my interest, winning me over, or spurring me on, I am going to set it down, and that is quite alright. I am eager to finally dig into so many of these titles that I’ve had waiting for quite some time. I will share reviews on some of these, I’m sure, but I’m not going to commit to reviews on all of them. If I do, happy surprise! :) I am on Goodreads, though, and I have a bookshelf specifically for 2019. Over there I plan on sharing snippet reviews with each book I finish. Ohhhhh, I’m getting excited, lovelies! I’m hopeful for curled up afternoons, even for 15-30 minutes, with a cuppa in hand, my candle lit, my phone tucked away elsewhere, and my bookish companion. I’d love to hear what’s on your book list for this year! And please please share any must-read fiction books with me, as well as any other titles that simply must be shared. For, though I’m not promising to add them to this year’s book list, I will forever be collecting new titles to add to the one-day list.